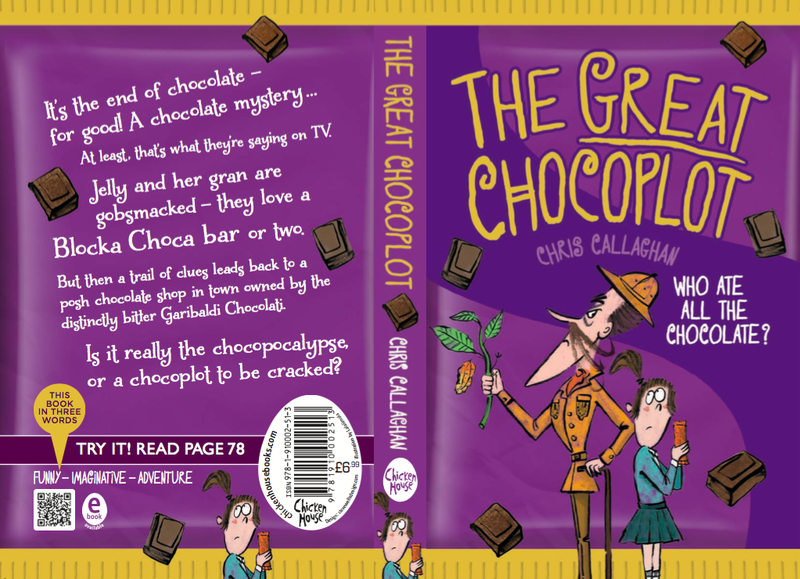 The Great Chocoplot is a fantastic debut book that will hit bookshops across the chocolate landscape early March 2016. The book was written for the author's 8 year old daughter as a Christmas present, and what an amazing present to give her. The adventure was then entered into Chicken House's open coop, which is a one-day amnesty for unpublished writers and was immediately chomped up for publication. The plot is like dipping your hands into a tub of Quality Street, as you never know what is going to happen from page to page. It is a brilliantly fast paced and funny rampage of chocolate madness. Just think about a world without chocolate, can you imagine that? If it all was to disappear - NO MORE CHOCOLATE - what would you do .....? Would you grab a bag of cheese and onion crisps instead? The story is so infectious that everybody and everyone will fall in love with this book, regardless of their age. It's very quirky and so immersive that it will make you smile and laugh out loud. Jelly is a plucky heroine - she's very well written and can be related to. Jelly and her crazy grandmother, who lives in a caravan on the families front driveway, take on an evil villain. Can they foil a devilish plan filled with a cataclysmic cocoa catastrophe? You'll have to buy a copy and read it, as I'm certainly not going to tell you. You will fly through this plot like a trolley dash in a sweet shop. It is an amazingly imaginative story, which is told with the heart and emotions of daily life struggles whilst still instilling a large slice of realism You will hurtle head first into a chocolate fountain of mayhem and ride the non stop nightmare. This is another cracking book from Chicken House - the home of good stories told with creative ability. It is my recommended enchanted read this Easter... so go and grab yourself a copy. Loved your review of The Great Chocoplot. I would love to include it in the March/April issue of Middle Shelf Magazine. I couldn't find your email address, so I'm hoping you see my comment. Let me know ASAP if have your permission to reprint your review. You would also be given the 2016 Best of the Blogs Award from Middle Shelf. Please email me at: laurisa@shelfmediagroup.com. Thank you so much. Hello Laurisa, that's fine go ahead. Thanks for popping by, and have a great week.